It seems oddly fitting that a movie about a bird trying to deliver a cute baby who spends most of the movie crying should itself spend most of the time being the equivalent of a $60 million dollar method for waving keys in front of the audiences faces. I understand that animation has gotten more energetic and free spirited these days, but the art of true cartoon movement is being lost more and more every year. Here is a movie that comes from Warner Bros, the company who used to be the undisputed masters of animation in terms of comedy (“Looney Tunes”) and drama (“The Iron Giant”), now reduced to making a movie where the animation doesn’t slow down, stop, or so much as pause. Like the keys you wave in front of your own child to lure them into a dazed sleep, “Storks” just keeps jumping around until the audience is too sleepy to even care. Even with the impressive 3D visuals on a giant IMAX screen I found myself slouching in my seat, head leaning against my knuckles, trying to pay attention while the occasional sound of a five year pacing behind me asked his mom if the movie was over yet. Every time I buckled down and paid attention to the screen I found myself confused: each scene felt exactly like the last with no variation to be found. What was on the screen could certainly be considered cute. How couldn’t it? It has babies, birds, and a college aged red head girl in it! How then, with so many cute images, could the movie not elicit anything else than a “eh, I guess that’s cute” from me? What’s more surprising is that “Storks” is a movie that actually has a good idea behind it. Like, it has a REALLY good idea behind it, in the fact that it tells the story about how storks used to deliver babies for a living, but got out of the business so they could deliver smart phones instead! In a rare twist, I actually found myself more interesting in the business model of the storks and how they came to the conclusion that delivered phones was more profitable than delivering babies. There is a scene that suggests a delivery went sour years ago that put a halt to the business model, but that just begged the question if the storks were such poor businessmen, would they dismantle their business again if something went wrong while delivering a phone as well? Never mind. I have not discussed the characters because there isn’t anything to discuss. The main hero has the goal to be the boss of the company (for what reason even he doesn’t know) and the villain simply doesn’t want to get back in the baby delivering business. The events that occur to actually move the plot forward are so convoluted even my notes didn’t make any sense at the end of the day. Ironically, “Storks” is preceded by a LEGO short. You may recall that Warner Bros. released “The LEGO Movie” last year, which was of such great quality I even selected it as one of the best films of the year. That movie was based on a concept that was doomed to fail, yet the studio did something great with it. “Storks,” as a movie, is a concept destined to succeed, and the studio seems to have done everything in their power to make it crash. Having the short before the feature is a reminder of just how much the company was able to revive their animation legacy with just one film, and to have “Storks” be shown right afterwards is all the more heartbreaking to witness. The movie was co-directed by Nicholas Stoller (who directed “Forgetting Sarah Marshall”) and Doug Sweetland (who previously directed shorts for Pixar). What I find particularly strange about this combination is that on paper it sounds like this should be a dream team. Stoller understands humor very well while Sweetland has demonstrated that he understands the art of movement in animation with his Oscar-nominated short “Presto.” The more I think about it the more I’m confused that something halfway decent didn’t come out of this collaboration. Maybe the combination didn’t work because Stoller has more interest in live action comedies, where as Sweetland’s directorial style may be suited better to shorts than with features. 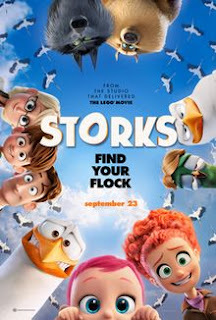 But whether through conflicting interests or lack of experience in feature animation, the duo have proven to be a toxic combination, as “Storks” is not only the worst animated film of the year, but one of the worst films of the year period, one that will only temporarily save parents from having to explain to their kids where babies come from. Parents, aside from being really stupid, there really isn't anything of concern here. Recommended for all ages.